Some sculptures invite interaction: "The Awakening," formerly in Washington, D.C., and "Alice in Wonderland" in New York's Central Park. 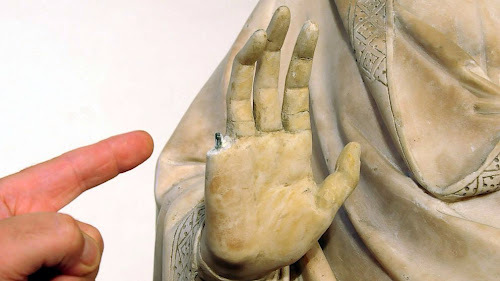 But an American tourist recently made international headlines when he touched a 14th c. marble sculpture while visiting the Museo dell'Opera del Duomo in Florence. He had spontaneously reached out to compare his hand with that of the Virgin Mary ("Vergine e all'Angelo Annunciatore" by Giovanni d'Ambrogio). He was immediately admonished by a security guard, but by then the little finger had come off exposing a metal rod inside. When questioned by police, he embarrassingly admitted what he had done and was not charged or asked by the museum to pay for the repair. In fact, the fragile fingers have been damaged and restored before and will be relatively easily repaired by the museum's full-time staff of restoration experts. Although the press was not satisfied until they had outed the offender, the lesson to be (re)learned is larger than this single offense. Fellow American Timothy Verdon, who heads the Diocesan Office of Sacred Art and Church Cultural Heritage and the Cathedral Foundation Museum in Florence, remarks, "He seemed to have forgotten the basic rule of museums that you don’t touch things."